Football season has begun, and we'd love to see you at a game! 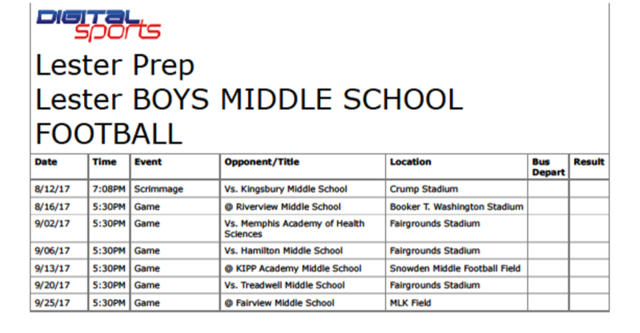 See the Lester Prep football schedule below. ALL Current LP students can purchase tickets for All football games at $3.00 per game when pre-purchased (before 4pm on game day) or purchased at the gate of LP’s home games. All Tickets purchased by NON LP students before 4pm on the day of the game can be purchased for $3.00 per game. Ticket cost at the gate for All NON LP STUDENTS is $5.00. NOTE: Tickets purchased at the gate when LP is not the home team, is subject to $5.00 admissions for everyone. ALL Current LP students can purchase tickets for HOME basketball games only at $3.00 per game when pre-purchased (before 4pm on game day) or at the gate of LP’s home games only. ALL Non LP students may pre-purchase tickets in advance for HOME basketball games before 4pm on game day for $3.00 per game. Tickets at the gate are $5.00. Tickets for ALL HOME Volleyball matches will be $1.00 for ALL LP students/$2. 00 NON LP students and adults.